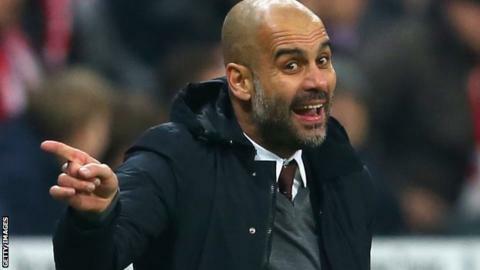 Bayern Munich boss Pep Guardiola says his move to Manchester City will not distract him this season. Guardiola, 45, has agreed a three-year deal to replace Manuel Pellegrini at the Premier League side in the summer. In six full seasons, ex-Barcelona coach Guardiola has won 19 trophies including six league and two European Cup titles. "Why would it be difficult? I am like a woman, I can multi-task and control both situations. I have a big talent for this," said Guardiola. Guardiola reportedly rejected a new contract with the Bundesliga champions last year and announced in December he would be leaving the club. His side are still chasing a league, cup and Champions League treble and could meet City in the latter stages of the European competition. "I cannot say something every week about it," said Guardiola. "It is another four months and for me it is not a problem. Newspapers can continue attacking and I will continue doing my job. "Coaches get little respect these days. It is everywhere like that. In Madrid, Barcelona, Germany, England. "There are respectable papers here that have not asked me a single question on football in these three years. "But that comes with the job. I do not understand it but I can live with it."